Regarding the Eurovision Song Contest (ESC) there are numerous controversies about discriminating and tactical voting. People vote for their neighbor countries and for countries with cultural similarities instead of evaluating simply the musical performance. If these biases were caused by the diversity of the different countries, voting biases should be less important for a national music contest with substantially more homogenous contestants. The question arises of whether biased voting occurs as well. Do national contests differ regarding their voting behavior? Is biased voting maybe unavoidable? The annual Eurovision Song Contest (ESC) is one of the most successful and longest-living international music competitions and television shows worldwide. At the same time, it represents a relevant example for the combination of media-based entertainment and public involvement – as well as of typical problems that can arise from this combination. Each participating country performs a song and gets a vote of points based on a combination of tele-voting by public audience and expert-jury. However, soon criticism surfaced that the audience would decide according to other criteria than the talent of the artists and the “quality” of the music performances. In public discussion, it was claimed that ESC outcomes were determined by informal cartels of country blocs voting for each other. The critique of biased voting behavior triggered an academic discussion in media and cultural economics. Various researchers have focused their study on voting patterns and collusive behavior in the ESC (e.g. Fenn et al. (2006), Ginsburgh and Noury (2008), Spierdijk and Vellekoop (2009), Haan et al. (2005), Clerides and Stengos (2006), Yair (1995)). These papers established empirical evidence for biased voting behavior, more precisely biases based on cultural and geographical closeness, ethnical and religious factors and linguistic affinity. While the most recent analyses empirically confirmed voting biases, they attributed the voting bias more to cultural-linguistic connections and geographical closeness between countries than to political issues (Ginsburgh and Noury (2008)). Consequently, multicultural relations are one of the main factors causing biased voting results. In order to contribute to this interesting discussion, we take advantage of some kind of a unique natural experiment that has been undertaken in German TV. The commercial TV broadcasting company ProSiebenSat.1 introduced a copy of the ESC on the national level in Germany, the so-called Bundesvision Song Contest (BSC). It is held annually and according to nearly the same rules as the ESC with the 16 German states replacing the European nations forming the ESC. Thus, we have a contest that very closely resembles the ESC but with much more homogeneous participants in terms of culture and linguistic traits. Accordingly, it is suspicious to analyze how (cultural) voting bias in the BSC differs from the ESC. 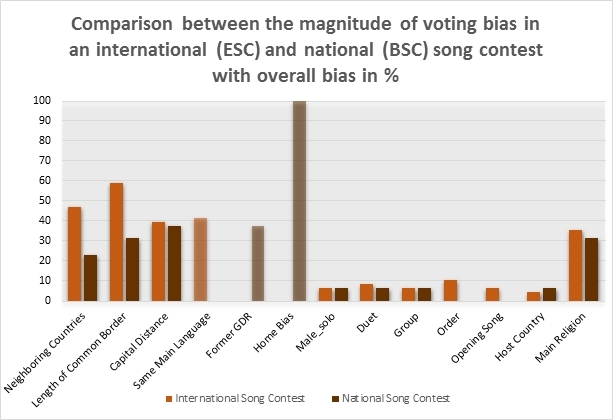 Consequently, the raising questions are (i) does culturally-biased voting occur in a national contest as well and if so (ii) are these biased voting patterns similar to those of the ESC? In order to test our hypotheses, we gather the complete historical voting data set of the ESC from 1998-2014, were tele-voting was introduced, and collect the BSC voting data from its beginning in 2005-2014. In each ESC 23-26 countries participate in the final competition (and a total of 43 country vote), in each BSC 16 German states. In total, we get 14055 observations for the ESC and 2560 observations for the BSC. In order to identify voting bias, we have first to determine “unbiased” (“quality”) voting. However, how to measure the quality of musical performance pose a challenge for scientists, because measurement requires quantifications and music-taste is not directly measurable. Since the quality of popular music is subjective, it is important that music correspond to the preferences of the audience. At the same time, popular music represents “mainstream preferences”. If the mass of individuals consider a musical performance as good, it represents “high quality” in the sense of a “mainstream preference”. Therefore the performance of a country, which has received the highest number of points is simply characterized as “high-quality”, while those with little points are considered as “low-quality” performances. If, for example, a country B has received only 1 point on average from all other countries, but the maximum number of 12 points from another country A, it seems rather unlikely that this is based on a “different” quality. On the contrary, the assumption suggests that other, independent factors are responsible for the deviation (overvaluation with a positive or undervaluation with a negative sign). Cultural characteristics (cultural similarities (Hofstede and Big Five dimension), linguistic similarities, religion). For example, the ‘friendship’ and neighbor bias between Cyprus and Greece can hardly be doubted when looking at their voting results in our data. While Greece received 3.0 points on average from all participating countries throughout all the years of its participation, Cyprus gave the maximum number of 12 points throughout all the years (13 times). The difference between 12 points and 3.0 points shows the ‘overvaluation’ as a possible bias (bias= 9.0), which we defined as our dependent variable, but for every single year. We tabulated the points given from each country to each other country for every single year. Because we want to find relationships among the above mentioned explanatory variables and our bias-variable, we model a statistical regression analysis. The table illustrates the results of our estimation. Here you can find some (selected) variables, which may influence the “unexplained” over- or undervaluation. -Former GDR- and -Home Bias- are only relevant for the BSC while the -Same Main Language- only matters for the ESC. Indeed, we find strong empirical evidence for the existence of voting bias in a national contest as well. When we compare the voting patterns of the international contest with the national contest, we find striking parallels regarding cultural similarities, performance and geographical aspects. Especially, geographically closeness is greatly relevant for national contests. So, voting biases cannot be avoided even if the voting parties share the same country, cultural and linguistic traits. Budzinski, O. and Pannicke, J. (2016), Culturally-Biased Voting in the Eurovision Song Contest: Do National Contests Differ?, in: Journal of Cultural Economics, doi:10.1007/s10824-016-9277-6. Oliver Budzinski is a Professor of Economic Theory, Institute of Economics and Institute of Media and Mobile Communication at Ilmenau University of Technology, Germany. Julia Pannicke is a Researcher and Ph.D Student at Ilmenau University of Technology, Economic Theory, Institute of Economics. She gratefully acknowledges financial support from FAZIT-Stiftung.